My dad and I used to watch Wings! That’s a fun reference! Yeah, Wings is great. I wish Paramount or somebody would remaster the episodes and release a set loaded with extras and what not. On Fassbinder, I've not seen anything by him. According to the very talented auteur, Yorgos Lanthimos, Fear Eats the Soul is the place to start. This he said when he was in the Criterion closet that one time. Admittedly, I have watched that one particular episode many times. Lanthimos is just fascinating to listen to. Last edited by javy; 03-25-2019 at 12:41 AM. How many people here have watched Berlin Alexanderplatz more than once? ...how many have watched it more than twice? I watched it once, then read the novel, and now am anxious to revisit the film. You owe it to yourself to read the book at some point. It’s amazing. As is the flick. I’ve seen about 10 of his! That’s a pretty good one! My first one was Marriage of Maria Braun, and I really liked that one! I just need to finish up his filmography! I’m gonna give Berlin a try again, hoping this time I can finish it! 5 times here full (and watched the Epilogue more). Huge Fassbinder fan though. I watched Berlin Alexanderplatz for the first time last year. It was astoundingly good, especially the epilogue. I'll probably watch it again sometime soon. lol, all you have to do is look at it like you're binging 1 season of a show. It's literally the same length. I love it. So anyone that goes back and re-watches a favorite show of theirs, that's the way I see it. I see how something this long can be a task to start for some, so just put yourself in that mindset could help. I'm going to end up watching it again soon, since I got the new blu-ray sitting here. The Marriage of Maria Braun is freakin' brilliant. I'm trying to think of how many I've seen, and since I just recently woke up I'm having trouble doing so. I think it's about 4 or 5? But that's if we count "World on a Wire" and I have not actually seen the whole thing. To be honest, it's pathetic. I've owned it forever and yet haven't seen the whole thing. I'm just sad. Has anybody seen Carlos Reygadas latest film Our Time? Was not expecting to like it so much, not sure why there was not much buzz about it, although I know some people will hate it, I found it maintained a good pace for a 3 hour film, the cinematography was beautiful and the way the main theme is exposed and made me reflex on it reminded me of Bergman, I wonder if this will also end up eventually in the collection. Last edited by pedromvu; 03-25-2019 at 07:08 AM. Remember that classic show, Wings, from the 90s? One night they're bored out of their minds and Joe asks Brian and Alex what they were doing for the evening, and told them that he was desperate. They said they were going to watch Berlin Alexanderplatz. Joe immediately responded, "not that desperate". Not that I would let that deter me from watching it, I can imagine it's probably very good, but that scene from Wings has always stuck with me. TCM is doing a run on David Lean films: Great Expectations, Brief Encounter, Doctor Zhivago, The Bridge on the River Kwai. Now I can watch both his Dickens classics together. I’ve been waiting for Great Expectstions to show. Any fans of Paul Schrader's Mishima: A Life in Four Chapters? I watched it for the first time last night. I'm not sure if I'll watch it again but I found it to be a well-crafted biopic. I particularly enjoyed the dramatizations of Mishima's works in order to illustrate his obsessions with beauty, body, and nationalism. If true, I'm eagerly anticipating Criterion's release of Silent Light. My R2 DVD just doesn't do it justice. One of the things I liked about Wings was their use of guest stars. Unlike a lot of shows that fell back on guest stars when the writers ran out of ideas, Wings incorporated the guest stars into the show's silliness. My favorite Wings guest star was the great William Hickey as Carlton Blanchard. Hickey had a long career and is probably best known as Don Prizzi from Prizzi's Honor, but his list of credits also included roles in Mikey and Nicky and Wise Blood. And, oh, yeah, Tony Shalhoub and Thomas Haden Church. Good stuff. Give me Kurosawa boxset for number 1000!!!!! Has anyone picked up The Lure? Does it have an English dubbed track or at least English subtitles? Wondering if it's worth a blind buy. It comes with English subtitles. English speaking labels would never release a non-English speaking film without subtitles. 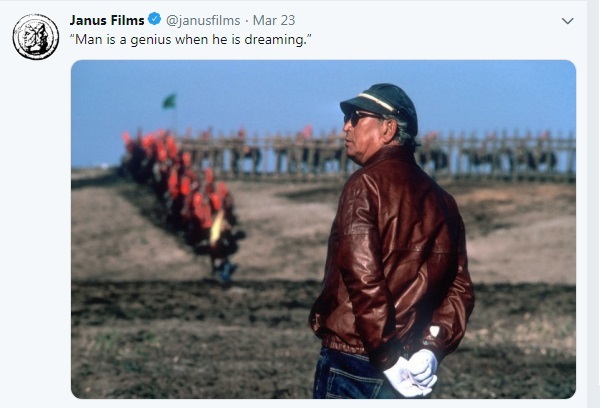 859 days since the last Kurosawa film was released on blu-ray. Red Beard was restored years ago. Seven Samurai 4k scan has been available for a few years. Stacking their chips?